Lexington, KY – May 7, 2015 – Seventy-four horse and rider combinations faced off Thursday evening in the first $34,000 Hagyard Lexington Classic CSI2* of the season, but it was Ramiro Quintana (ARG) who took the night’s victory with Whitney. The talented combination beat out a field of 24 during the nail-biting jump-off, tripping the timers in a speedy 41.27 seconds. Quintana and Whitney, owned by St. Bride’s Farm of Upperville, VA, have proven their partnership over the last two years, claiming top honors at shows across the country. They are now amping up for the Pan American games in Toronto, Canada this summer. Their efforts kicked off the seven-part Hagyard Challenge Series featuring the $50,000 Leading Rider Award. Richard Jeffery designed the long track, creating a course that would ask the right questions without over facing the horses. He utilized a water jump, liverpool oxer, three double combinations and long stretches of the Rolex Stadium to challenge the pairs. Alise Oken and Kaid Du Ry, owned by High Hopes Farm LLC of Charlotte, NC, were the first to post a double clear effort over the shortened track. Their time of 46.56 seconds set the pace to beat; however, it would prove conservative with the South American riders hot on her heels. Three trips later, Daniel Zetterman (SWE) surpassed her time with Chellana B, owned by Gyllebo Farm of Wellington, FL, soaring over the final oxer in 43.34 seconds to take the lead. Wilton Porter was in hot pursuit of Zetterman’s time, but he was a fraction off with Patriot, owned by Sleepy P Ranch of Bartonville, TX, finishing in 44.680 seconds without fault. It was not until Venezuela’s Andres Rodriguez and Fifty Fifty 111, owned by Arao Enterprises, took their turn at the track that defeat seemed a possibility. They put in a blazing time of 41.64 seconds, surpassing Zetterman by nearly two seconds to take the lead. Three-time Hagyard Challenge Series winner, Pablo Barrios, attempted to catch Rodriguez’s time, and he did. An unfortunate rail in the double combination, as well as a final nick on the final fence would cost Barrios and Antares the victory, even with their faster time of 40.68 seconds. Quintana and Kaitlin Campbell were the final two of the class, and as the penultimate rider, Quintana knew he had to leave no stone unturned. He kept a consistent pace from beginning to end, however, and early distance to the second to last fence would shave off the crucial four-tenths of a second that would knock Rodriguez out of the lead and have Quintana’s name take the top spot on the leader board. Campbell and the 17-year-old Rocky W were the last to go, but they were a nickel shy of the top two times, breaking the beam in 42.71 seconds for the third place. This is the first time in two years that the Kentucky Horse Shows have reinstated the FEI competition, offering two weeks of CSI2* and CSI3* classes. Tonight’s victory will also earn Quintana valuable points towards the Hagyard Challenge Series, which seven grand prix classes to be held during the 2015 show series at the Kentucky Horse Park. Following the final event, a cash prize of $50,000 will be awarded to the rider accumulating the most points throughout the series, as well as a $10,000 prize for the reserve champion. The jumper action at the Kentucky Spring Horse Show will continue tomorrow with the 1.45m Open Jumpers and the Junior/Amateur-Owner Jumpers in the Rolex Stadium. This week’s highlight events also include Saturday evening’s $85,000 Mary Rena Murphy Grand Prix CSI2*, the $25,000 Bluegrass on Sunday and the $25,000 Under 25 Grand Prix. The Kentucky Horse Shows 2014 series includes two weeks of top hunter/jumper competitions during the month of May. The Kentucky Horse Show Series is the host of the Hagyard Challenge Series and Hallway Feeds USHJA National Hunter Derby Series. A special thanks to the generous sponsors of the Kentucky Spring Horse Shows: Hagyard Equine Medical Institute, Hallway Feeds, Hollow Creek Farm, Audi of Lexington, Sleepy P Ranch, CWD, Farm Vet, Dietrich Insurance, Take2 Thoroughbred Program and the Official Hotel The Clarion. Lexington, KY – July 26, 2014 – Argentine rider Ramiro Quintana has been partnered with Whitney for two years, but their hot streak just began this summer. After winning their first grand prix together two weeks ago in New Jersey, they traveled to the Kentucky Summer Horse Show to showcase their winning ways. In front of a packed house at the Kentucky Horse Park for Hats Off Day, the pair raced away with the $50,000 Rood and Riddle Kentucky Grand Prix victory against an international field. The jump-off included the end of the triple combination, as well as multiple sharp rollbacks. The first to return was Great Britain’s Gemma Paternoster with Osiris, owned by Julia Harrison-Lee. They were the pathfinders, leaving each rail intact as they stopped the clock in a tidy 40.926 seconds to set the time to beat. Venezuela’s Emanuel Andrade tried to catch Paternoster’s effort with Hardrock Z, owned by Hollow Creek Farm, but their attempt led to a rail in the combination for four faults and the fourth place award. Paulo Santana of Brazil was even less lucky, bringing down all of the final oxer in the combination and having to retire from the round with Taloubet, owned by Santana Stables, taking home fifth place. Quintana was prepared to face the challenge at hand with his experienced mount Whitney, owned by St. Bride’s Farm. Tight turns at the end of his round and a stride left out to the final oxer paid off when he dashed across the finish line in a speedy 38.008 seconds with all the fences up to take over the top spot. Venezuela’s Juan Ortiz was the only remaining contestant with Tina De Noyelles, owned by the Synchronicity Group. He gave it his all, but one extra stride to the final fence proved costly when he stopped the timers at 38.700 seconds, just 7/10ths of a second shy of Quintana for second place. Today’s event was a part of Hats Off Day, a special celebration of the horse and its impact on the state of Kentucky hosted by the Kentucky Horse Park. A large crowd filled the Rolex Stadium to cheer on Quintana during his winning round. The Kentucky Summer Horse Show will conclude tomorrow with the Show Jumping Hall of Fame Classics for the High Junior and Amateur-Owner Jumper divisions. 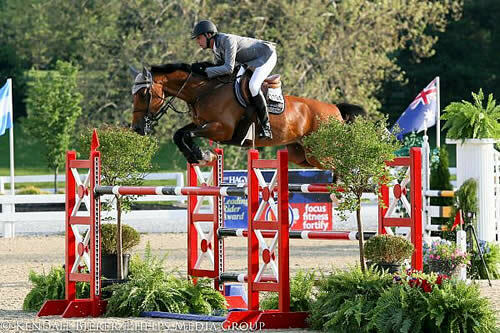 Riders will return next Tuesday for the kick-off of the Kentucky Summer Classic, featuring the fourth $25,000 Hagyard Lexington Classic and the $50,000 Kentucky Summer Grand Prix, sponsored by GGT Footings. For more information on the Kentucky Summer Series, please visit www.kentuckyhorseshows.com. Wellington, FL – February 12, 2014 – The Ridge at Wellington’s Turf Tour returned to the International Polo Club Palm Beach today for its sixth week of competition. 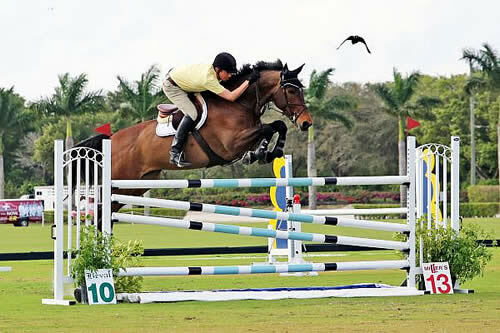 The 1.30m-1.35m Jumpers kicked off the halfway point of the series, where Ramiro Quintana piloted Largo to the pinnacle of the rankings in the red class, dominating the standings as all other contenders attempted to match their speed. It was Philip Richter and his veteran mount Ray Ray that took the top earnings in the green class. The morning welcomed competitors to the open grass field at the International Polo Club (IPC) in Wellington, Florida. Quintana set the pace as the eleventh rider to traverse the track. He utilized the open field to keep a consistent rhythm and open his mount’s stride, shaving the seconds and breaking the beam in only 34.612 seconds. The victory was his for the taking as each consecutive rider attempted to best their speed and accuracy without avail. Peter Lutz finished in the second place position with Don’t Stop O in a speedy 35.471 seconds, while Jeffery Welles and Antaris S earned the third place award. Hillary Simpson and Arkansas rode to the fourth place position, and Mario Deslauriers piloted Hamlet to the fifth place. Leslie Howard and Zaragoza rounded out the top six with their quick and tidy jump off. Earlier in the morning, Molly Ashe was the first of the field to clear the Eric Hasbrouck designed course. She rode to a double clear effort in the green class, setting the pace with a time of 37.719 seconds aboard Emerald B, owned by Monica Carrera, forcing competitors to chase her time while trying to duplicate her clean effort. Andrew Bourns and Venice, owned by Jaybird Farms, had their sights set on the prize today. Although it was their first trip to the Wellington Turf Tour for the 2014 circuit, they wanted to leave their mark. They easily navigated the opening course and moved into the jump off where they raced the clock, breaking the beam in 35.599 seconds. It seemed as though Bourns had victory in his grasp, until the final rider of the day, frequent weekend warrior Phillip Richter navigated the 18-year-old Ray Ray to the winning time of 34.506 seconds. Richter shows Ray Ray very sparingly in Wellington, using a minimalist approach to train and prepare. The turf proved ideal for the young horses, but even more so for Richter’s veteran mount. The pair prepares on turf more so than sand, to avoid the consequences that could affect his horse’s tendons. Bourns finished in the second place position with Venice, while Roberto Teran and ADC Chef Z took home third. Ashe nabbed the fourth place finish for her early lead aboard Emerald B, and Henrik Gundersen with Adlanteur was awarded the fifth. Emily Hill and Rio finished with the sixth place ranking. The Ridge still has available sponsorships for the Invitational Series. For more information, call (908) 500-0996 or download information at www.theridgefarm.com. Sponsorships are available for the $25,000 Finale, $15,000 Weekly Grand Prix, $2,000 Weekly Hospitality Text, $3,500 Show Jump Sponsor for series, $750 Ring Banner for the series and $500 Weekly Class Presenter. All checks should be made payable to the Ridge Farm LLC. Darragh Kenny and Picolo. Photos by Tony DeCosta. 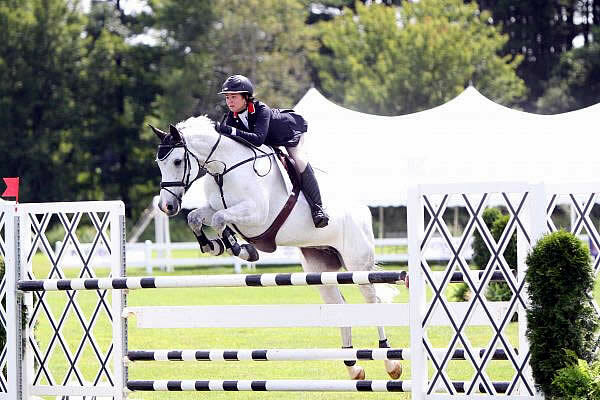 Hampton Falls, NH – August 7, 2013 – Five days of exciting show jumping got underway on Wednesday as the inaugural Silver Oak Jumper Tournament lifted off under gorgeous partly sunny skies in what’s known as the Seacoast region of the Granite State. For those that have never made the trip to New Hampshire, we suggest you put it on your to do list right away. This is a beautiful part of the United States that stretches for miles along the Atlantic Ocean from New Hampshire’s border with Massachusetts to the Piscataqua River and New Hampshire’s border with Kittery, Maine. Hampton Beach is a wonderful beach town, right on the ocean with classic old hotels with balconies overlooking the main drag, magnificent beach houses, the famous “Shell” and some of the best seafood (and fried dough) you’ll ever get a chance to eat. Here are a few other things you might not know about New Hampshire. Of the thirteen original colonies, New Hampshire was the first to declare its independence from Mother England, a full six months before the Declaration of Independence was signed. In 1833 the first free public library in the United States was established in Peterborough. New Hampshire adopted the first legal lottery in the twentieth century United States in 1963. The Pierce Manse in Concord is the home of the only New Hampshire citizen ever elected President, Franklin Pierce, and most importantly, the Bavarian-style hamlet of Merrimack is home to one of the famous eight-horse hitches and the Clydesdales maintained by the Anheuser-Busch Brewery. Just a couple of miles down the road from the beach is the Silver Oak Equestrian Center, a horseman’s jewel in Hampton Falls, NH. Show Chairman Jeff Papows has spent a year and a lot of money getting the property ready for this year’s event, including a complete makeover and change of location of Jumper Ring #2 and making sure the stunning grass grand prix field is in perfect condition. His hard work has been rewarded with nearly four hundred horses turning out for this inaugural offering. “We couldn’t be more excited,” said a delighted Papows. “The phone hasn’t stopped ringing this past week and all of us are delighted with the turnout for the show. We had to overcome a lot to get the show rolling this year. We had to deal with cautious exhibitors who were scared by the terrible press the previous event garnered and then the worst blow of all, the death of my dear friend David Birdsall,” he said. Birdsall, who passed away unexpectedly earlier this year, was the owner of the Silver Oak Equestrian Center. There will be a special ceremony honoring his memory during Sunday’s Grand Prix festivities. There’s a new Vendor Village location, with a number of fun shops located there and others situated across the grounds. And the food… the food is going to be great if last night’s opening staff meeting and get together is any indication. The White Apron, located in Dover, will be providing their delicious delicacies throughout the week. They have won numerous awards and it’s easy to see why. Germany’s Olaf Petersen, Jr. is on hand to design the course for this year’s Silver Oak Tournament. Petersen, one of the world’s most popular and respected builders, has worked the world’s best shows, including the 2004 Athens Olympic Games and the North American Junior and Young Rider Championships. In the first event of the day, the 1.20m Open Jumpers, Time First Jump-Off class, it was junior rider Maria Brugal scoring the victory with her feisty gray horse Arann DV. The fifteen-year-old rider ripped through the short course in 45.357 seconds for the win, topping a starting field of forty-one in the opening affair. Of the forty-one that went to the post, fifteen went on to the jump-off, fourteen of those going double clear. Second through fourth places were tightly bunched within the 46 second range. Eight tenths a second behind in second place was Kevin McCarty and Ambitious who tripped the timers in 46.127 seconds. Third place went to Allyson Shryoc, piloting Cheval D’Espoirz to a final time of 46.227 seconds, just a tenth of a second off the pace for second place. Rounding out the top four was Maria Brugal’s second mount, Diabolo Van Cadzandhoeve, crossing the finish line in 46.780 seconds. The 1.30m Jumpers, also scored at Table II, Sec 2b Time First Jump-Off class was next with thirty-one going to the post. The last proved to be the best as Ramiro Quintana stormed to victory on Bialda, a top seven-year-old Young Jumper owned by St. Bride’s Farm of Upperville, Virginia. Quintana blasted through the finish line in 34.719 seconds to steal the win from Darragh Kenny and Mantana, owned by Oakland Ventures. Kenny had held the lead since the thirteenth to go in order. Kenny’s second place time was 35.483 seconds. Kenny also secured third place with Quiz, second to last to go in the class. Quiz, also owned by Oakland Ventures, tripped the timers in 36.454 seconds. Rounding out the top six were Lauren Tisbo and Tequesta Farms’ Sting Van de Withoeve, Peter Leone aboard Alias, owned by Kiva Iscol and Candice King with Bellissimo LLC’s VDL Maleklou. Tisbo clocked in at 37.133 seconds, Leone broke the beams in 37.548 seconds and King came home in 37.670 seconds. Of the thirty-one that started, sixteen went clear the first time and fourteen went on to be double clear. The final event on opening day was the 1.40m Open Jumpers, Table II Section 2b, Time First Jump-Off with twenty starters. This time around, Irish rider Darragh Kenny left no doubt, making sure he wouldn’t get bumped out of the top spot. In fact, he finished first and second to wrap up a very successful afternoon. Kenny, who had been leading with Quiz, another Oakland Ventures entry in 34.732 seconds, managed to slice a tenth of a second off of that time with Picolo to finish in 34.633 seconds for the victory. “I bought him during the off week at Spruce Meadows,” Kenny noted. “He came from France two weeks ago and went straight to HITS Saugerties where he placed in all four grand prix over the two weeks in Saugerties. He was second last Friday and second in the $100,000 grand prix up there. I brought him here and wasn’t really intending on showing him today, but I’ve only had him two weeks and had never ridden him on grass, so I thought I’d get him out and see how it goes,” he said. Molly Ashe-Cawley finished third in today’s 1.40m class with Lincourt Gino, owned by Monica Carrera. Crossing the finish line in 34.883 seconds, Ashe-Cawley missed the mark by just 2/10ths of a second. Fourth place went to another Darragh Kenny mount, Cequila, owned by Oakland Ventures, who broke the beams in 35.248 seconds. Fifth place went to Ziedento and Ramiro Quintana for the St. Bride’s Farm and sixth went to Wiesielottie from the Winley Farm. The $20,000 Welcome Stake highlights tomorrow’s show schedule, along with a variety of Open and Junior-A/O Jumper classes. 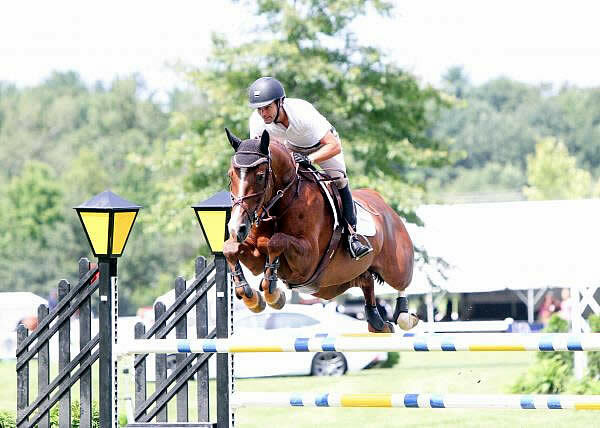 The $75,000 Equestrian Estate Planning Group Grand Prix dominates the Sunday schedule in Hampton Falls as an elite group of top riders will vie for big prize money in the class and the $25,000 Boston Strong Bonus. 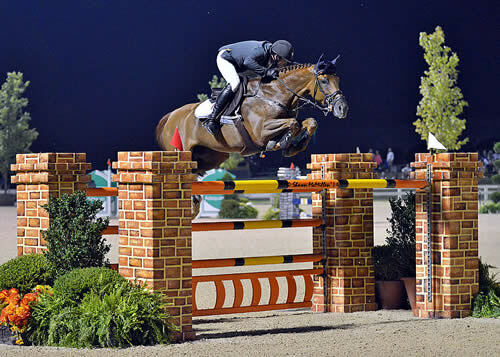 The $25,000 cash prize will go to any horse and rider combination that win both the $75,000 Equestrian Estates Planning Group Grand Prix at Silver Oak and the Grand Prix at Fieldstone next week. Sunday’s Grand Prix is preceded by the $15,000 Agero Speed Classic. 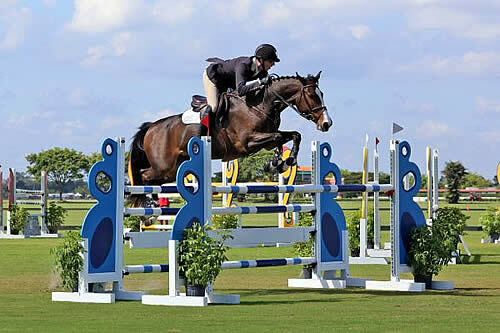 Saturday’s session features a number of exciting show jumping competitions, including the Show Jumping Hall of Fame Classics for top Junior and Amateur Owner Jumpers and the $15,000 DG Ventures Speed Derby, a challenging test over 18-20 obstacles in a race for the title. ©ESI Photography. Ramiro Quintana and Double H Farm’s HH Narcos Du Marais had a big weekend, riding to victory in the $40,000 HITS Grand Prix. 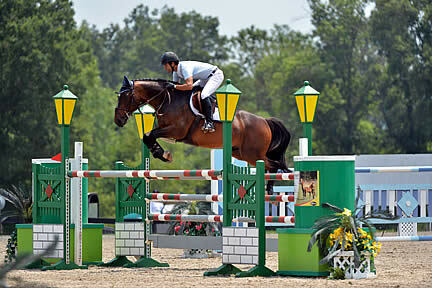 CULPEPER, VA (July 10, 2012) – Ramiro Quintana put just one month worth of work to good use as he piloted HH Narcos Du Marais to the top spot in Sunday’s $40,000 HITS Grand Prix, presented by Pfizer Animal Health, at HITS Culpeper. After just 30 days with the 11-year-old Selle Français gelding, owned by Double H Farm, Quintana found himself in the ribbons. Despite a heat wave that blazed through much of the East over the weekend, horses and riders alike returned to HITS Culpeper to meet the Showday National’s qualifying opportunity for HITS Championship Weekend. Quintana of Wellington, Florida and “Narcos” led off the Sunday afternoon Grand Prix and were the first to go clear and pick up a qualifier for the famed Pfizer $1 Million Grand Prix. He met four other pairs in the jump-off.